On May 14, 2014, I represented Y Street at Benjamin Franklin Middle School in Rocky Mt, Virginia. 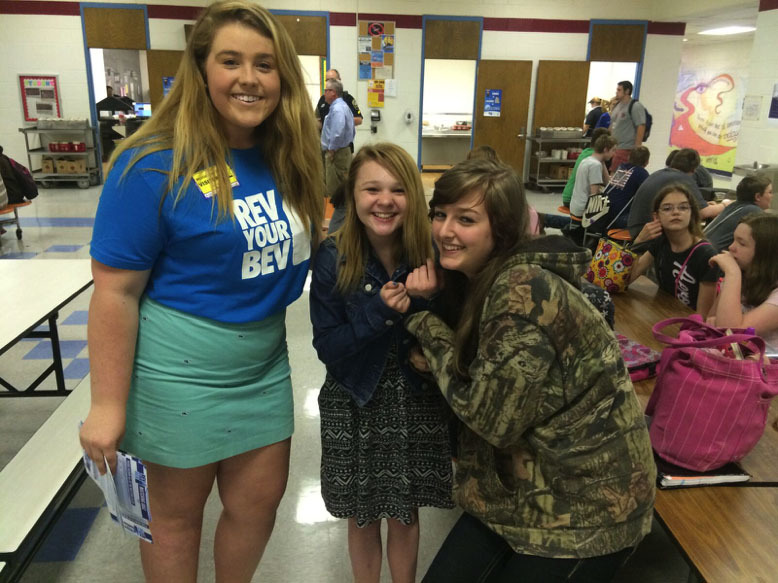 The students participated in Rev Your Bev Day during their lunch period. Overall, the kids had a very positive attitude. I remember a young girl at the event who was so shocked by the sugar cube display and how many sugar cubes were hiding in the beverages she loved. From the knowledge she gained at Rev Your Bev Day, she decided to drink fewer sugary drinks. This showed me that through Rev Your Bev, we are effectively sharing information about the harm of sugary beverages. Rev Your Bev Day is so important to me because since I quit drinking sugary beverages, I feel so much better. From my own experience, I have noticed that caffeine and sugar had negative effects on my health. I was initially interested in hosting a Rev Your Bev Day event because I am passionate about sharing knowledge to help influence Virginians to live a healthier lifestyle. I hope that through Rev Your Bev, I can share my own experience, as well as information to help change the way Virginians think about sugar beverages for the better. Maggie Toms is a senior at Carlisle High School in Martinsville, Virginia and an active member of Y Street, a program of the Virginia Foundation for Healthy Youth.